Super Yacht Charter SPECIAL AQUASITION : Now offering 8 Nights for the price of 7! Charter this luxury yacht in New England or The Bahamas. Paul was raised in the historic Ramapo Mountain region of New York State. Upon graduating high school Paul felt the need to serve his country. He joined the United States Coast Guard which launched his career on the sea. He would spend the next 9 years with the Coast Guard achieving numerous acolytes and awards for outstanding service and achievement. From there he worked on multiple boats around the United States in various lines of fascinating work. In 1986 Paul discovered yachting, due to his coast guard background, Paul has found yachting to be an exceptional fit. 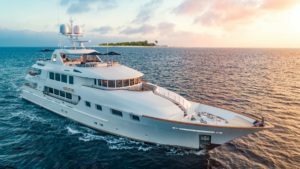 He has had a fulfilling career captaining many yachts ranging from 90′ to 240’ and meeting his wife (a former yacht chef!). These days Paul has managed to find the balance between yachting and spending time with his family. Off duty you’ll likely find him taking his son, Pieter (age 7) on bike rides or attending school performances. When it’s time work however, you won’t find a more organized and professional captain on the water! The whole Aquasition team is thankful to have a qualified captain behind the helm and a leader who has their best interest at heart. Andrew will be your local guide in the Northeast this summer! He was born, raised, and sailed out of Newport, RI. Not only does he know the surrounding area by sea, but also by air! Andrew is very goal oriented and achieved his childhood goal of becoming a pilot by age 17. Upon completing high school Andrew chased his love for the ocean into yachting. He has over eight years in the industry and is currently completing his new goal by achieving his 500 ton USCG captains license. His overall career goal is to become a yacht captain and to meet the love of his life. Andrew is excited to share his hometown and surrounding areas with charter guests this summer. His local insight will set Acquisitions charter program ahead of the rest. He enjoys getting to know guests and adding personal touches to each trip. Megan grew up in Jensen Beach, a small beach community in South Florida. Her love affair with the ocean started at a young age because she was always out on the boat fishing, snorkeling, and enjoying water sports with her younger brother. She has a passion for helping others and pursued a degree in nursing until she was exposed to the Yachting Industry in 2012 when she moved to Fort Lauderdale. Megan is a bubbly, approachable yet professional Chief Stewardess. She enjoys being creative, making her guests laugh, creating a warm and fun environment on Motor Yacht Aquasition, and creating an unforgettable experience for each and every one of her guests that come onboard. Megan has travelled most of the beautiful Caribbean, all of the East Coast of the United States, all the way up north to Canada and throughout the Great Lakes. She has also traveled South East Asia where she obtained her 400hr Yoga Teacher Certification. Megan is passionate about her job and is so grateful to combine her love of traveling, the ocean, and caring for others. She is looking forward to welcoming you onboard with her big smile and positive attitude! Jeremy has many years in the food industry under knife! After high school he studied at the Joneson & Wales University in Miami, while working full time at the Sheraton Bal Harbors showcase kitchen. Jeremy wanted too add traveling to his repertoire and began working as a freelance chef. He has worked within private households, mega yachts and highly classified government ships all over the world. Jeremy became well sought after for his acknowledged highest degree of integrity and discretion and meticulous attention to detail. It became inevitable for Jeremy to step onboard permanently while he applies his love for traveling and exploring various cuisines. He enjoys growing personally as he expands his cuisine expertise into a wide variety of tantalizing specialties. Jeremy has worked aboard various size vessels the past eight years. Jeremy is a very personable, enthusiastic and flexible chef. He will present you with an exemplary dining experience while providing first-class service with a smile. Jeremy can undertake a broad range of tasks with excellent organizational skills, and with an always ‘can do’ attitude, he looks forward to preparing you something amazing while you relax onboard AQUASITION.